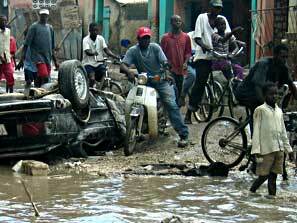 In 2004, devastating floods hit Haiti in the wake of tropical storm 'Jeanne', killing thousands and practically submerging the town of Gonaives. Aid workers at the scene needed to rapidly develop and deploy a victim-registration and photo-Id database. The system had to record personal information (including a photo) and the victims' needs, then print a photo Id card that would give survivors immediate access to the appropriate resources when presented at an aid station (food, clothing, shelter, medicine/treatment etc). Working under immense pressure, and with very limited time and resources, a solution was developed on-site using Access 2002. "The program worked great" recalls Dale Weaver "except for the way Access stores OLE graphics - databases had to be split into multiples of 50 records each, or the files would get too large". This huge storage overhead (often between 10 & 100 *times* the original file size) is just one of the potential undesirable side-effects of using 'OLE Embedding' to store photos, pictures and images in Access (a technique now effectively withdrawn by Microsoft since Access/Office 2003). "I just downloaded your control for MS Access. This is exactly what I'm looking for"
DBPix stores image data without any additional overhead, and in a totally non-proprietary and portable format, avoiding all of the 'OLE Embedding' problems while offering a range of usability enhancements, capabilities and significant performance benefits. With 'data-binding' it's as easy to use as a text control (from zero lines of code), while the programming model supports high levels of automation and integration if required. Weaver Companies Inc support this and other projects in Haiti.